What makes a good travel insurance policy? There are some things most of us would say were essential travel concerns: having a serious accident, having to stay in a foreign hospital for a long period of time, or having your personal possessions (or even your passport) lost or stolen while you are away. Most travel insurance covers these basic risks as standard, but sometimes cheaper providers offer reduced payout limits – which could be a problem if you get into serious difficulty whilst abroad. Be sure that you know how much travel cover is provided and what amount of excess you are expected to contribute. 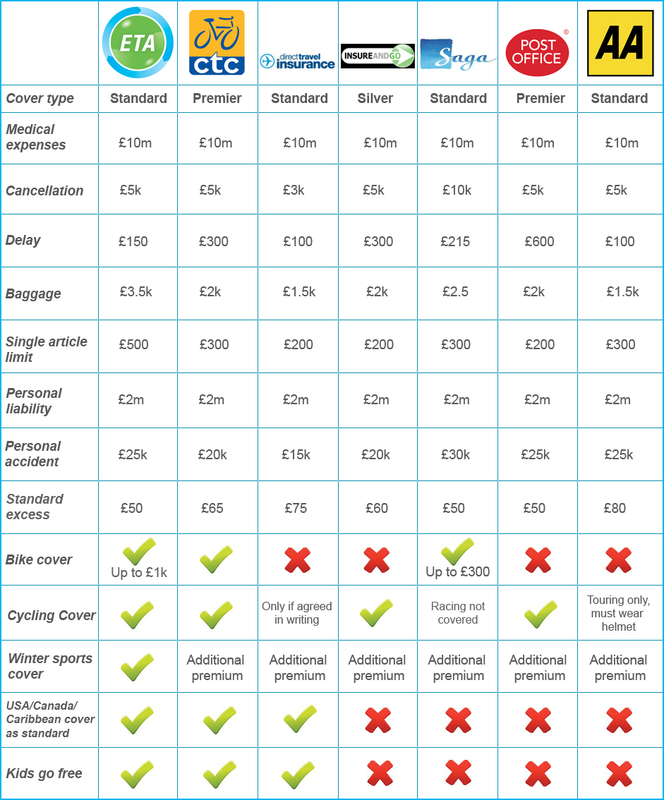 To help you compare travel insurance, we’ve put together a table putting our policy up against that of some of the other well known travel insurance providers. We’ve limited this comparison to annual travel insurance policies, and have looked at some of the key areas of cover you’ll need to consider when choosing your provider. Policy information was taken from policy wordings and is correct as of 6 February 2015. How much excess are you likely to have to pay? While the ETA has a simple policy of asking for a flat contribution of £25 (annual) or £50 (single-trip), many other insurers vary the amount of excess you have to pay for different types of claim. Make sure you are aware of the standard excess on your travel insurance policy, and you’ll avoid any nasty shocks when you’re at your most vulnerable. If you are planning on doing any activities that could carry higher levels of risk, make sure you check with your insurer that you are covered for them to avoid being in breach of policy. Winter sports are fun but also carry a reasonable risk of personal accident which is why most insurers charge an additional premium for covering these activities – but not the ETA! We cover winter sports as standard, with no limit on the number of days you can spend on the slopes. If you plan to cycle whilst abroad, you’ll want to make sure you’re covered against the associated risks. Under personal possessions, most travel insurers exclude bicycles, or will not agree to cover cycling as an activity, meaning that if you injure yourself whilst on a bicycle you might not be able to claim for medical expenses. ETA Multi-Trip Travel Insurance, on the other hand covers cycling, and will cover your bicycle up to £1,000 against loss or vandalism. Our single-trip policy will cover your bicycle up to £500. If you’re looking for year long protection, or if your bike is worth more than £1,000, you would be much better off considering ETA Cycle Insurance, which cycling for up to 90 days in Europe and 45 worldwide per year. Do you have pre existing medical conditions? With some insurers, past medical conditions can continue to affect your ability to get full yearly travel insurance cover – or you may be slapped with hefty additional premiums. The ETA is rare in being one of the few insurers to cover any pre existing medical conditions, as long as they haven’t changed in the last twelve months and you tell us about them beforehand*. If you have a medical condition which has recently been diagnosed, or has changed within the last twelve months as described above, we recommend goodtogoinsurance.com, who will be able to provide a quote tailored to your individual medical requirements.